In the world of corporate technology training, blended or hybrid learning is a recent introduction. While a few learning providers have launched offerings, only Global Knowledge has implemented a solution that utilizes the true potential of a blended learning delivery model. In researching the competition for our new Blended Live delivery method, I was struck by how innovative Global Knowledge’s blended learning solution truly is. First, some definitions: Blended or hybrid learning is the combination of instructor-led instruction (face-to-face in a physical classroom or virtually through an online conference solution) and on-demand learning (videos, tutorials, virtual lab exercises). But blended learning isn’t merely the sum of its instructor-led and on-demand parts. The unique advantage of blended learning is the problems it solves—the specific challenges facing modern business learners. As technology has advanced, the line between work and personal time has blurred. And with increased technology mobility, your work access isn’t confined just to the office. This includes taking calls while driving, answering emails outside of work hours, responding to work requests while on vacation or when traveling, or doing any or all of these while attending a training event. The true benefit of blended learning is its ability to allow learners to train in an ultra-connected world. Blended learning also has the opportunity to produce superior learning outcomes, improved content retention, and increased skills acquisition. The best blended learning solutions incorporate elements of a flipped classroom methodology, which assumes that current educational constructs are doing it all wrong. Traditional classroom concepts involve an instructor delivering general content through lectures, and homework or exercises reinforcing that content. A flipped classroom methodology delivers the general lecture content via an on-demand source. An instructor would then lead sessions designed to support and reinforce this content, engaging the student and being available at the time questions are most likely to be asked. An additional key topic for blended learning (and it’s integral for Global Knowledge’s blended solution) is challenge-based learning. This learning theory places the exercises, labs and “homework” at the center of the learning experience. It assumes that students learn better and retain more knowledge if they learn by doing. In combination with a flipped classroom, challenge-based learning enhances a student’s learning experience and enables improved learning outcomes. How is blended learning a better way to learn? The answer depends on what you are trying to learn. It depends on how you prefer to learn. It depends on how comfortable you are with technology. In the past five to 10 years, blended and hybrid learning methodologies have become increasingly prevalent in K-12 and at colleges and universities. Younger professional learners are more experienced with these learning methods and have a greater acceptance of online and blended learning deliveries. For over 20 years, Global Knowledge has built its business on session-based, set-time, instructor-led training. We have seen the demand for training deliveries shift. In the early 2000s, students preferred training in a physical location (e.g., a classroom), driving or traveling to these physical locations to learn the latest technologies and IT solutions. Around 2010, we saw customer demand shift to virtual classrooms. These sessions still occur on fixed dates but are delivered virtually over the internet with students attending from across the country or the world. What drove this shift? Improvements in high-quality conference solutions, reductions in training and travel budgets, and increasing workloads—students were struggling with the backlog of work minimizing training effectiveness and delaying when and if they could apply what they learned. Enter blended learning. With all things equal, blended learning isn’t a better learning method for all situations compared to instructor-led or on-demand training, though it does better address challenges that today’s learners face. (See below chart.) Blended learning provides options with one result in mind—better trained students. Figure 1: Studies internal and external to Global Knowledge show a blended learning approach fulfills more learning goals than instructor led training or on-demand learning. Blended learning is flexible. Students have been finding it increasingly difficult to be out of the office for days at a time. With increased workloads, thin labor forces, and 24-7 access, training can create large backlogs and is often disrupted by everyday events at the office. By limiting instructor sessions to a single 3 to 4 hour session per week, spreading the course duration over multiple weeks, and delivering the bulk of the training via on-demand learning (which can be consumed at any time, interrupted and restarted, and in time increments that are convenient to the learner), blended learning allows students to fit training around their schedules. Where it might be difficult to block out an entire week for live training, students can more readily find 3 to 4 hours per week for a dedicated session and complete on-demand assignments when their schedule allows, at night, or on weekends. Blended learning includes live instruction. As students shifted from classroom to virtual classroom training over the past decade, another shift has occurred over the past few years to on-demand training products like self-paced courses or learning subscriptions. These products offer plenty of benefits to the modern learner—reduced cost, less impact to working hours, and access to a greater amount of content. But recently the shift to these products has stalled. The selling point of flexibility cannot make up for a lack of skill development. Companies have purchased these products for cost and work impact reasons but their employees aren’t gaining the skills their companies need. Skills gaps are widening—they’re up nearly 40% since 2016.1 Universally, completion and utilization rates for self-paced classes are low. Students just aren’t gaining skills the way they did in classroom settings. Which is why the instructor-led portion of blended learning is so key. With blended learning, on-demand content is reinforced by expert-led instruction. Students have access to an expert for questions, direction and mentoring. If you rely solely on an annual e-learning subscription for your training needs, you have no regular expert interaction. Are you OK with no instructor access for a full year? When your skill need is more critical, formal training is your better option. For interesting or emerging skills, maybe you can get by on self-study (e.g., online research) or e-learning libraries. But for high-value, high-priority projects, blended and instructor-led training provides your greatest opportunity for success. Time is valuable. Blended learning allows students to maintain their day-to-day responsibilities, preventing them from falling behind at work, and allowing them to remain productive and effective while they train. Students have been increasingly aware of the work piling up back at the office. Or worse, they’re distracted from training while trying to solve issues back at work. With these distractions, companies aren’t getting well-trained employees and students aren’t learning effectively due to the increasingly disruptive nature of today’s job expectations. Blended learning manages these issues through flexibility, allowing students to maintain their day-to-day responsibilities while they train. By restricting dedicated sessions to a single 3 to 4 hour session per week and completing the bulk of the training material as on-demand learning, students are able to complete training with less impact to work responsibilities or their personal time. And I don’t want to minimize the impact of today’s job expectations on employees’ personal lives. If work disruptions are dramatically impacting training opportunities, you can be sure they are impacting peoples’ personal time which exasperates the difficulty to attend training. Blended learning minimizes this impact by allowing students to not have work responsibilities bleed into personal time and impact their home life. Global Knowledge has been delivering blended learning solutions for over 10 years. Various programs have included on-demand content, access to a mentor, post- or pre-course lab access, or on-demand course recordings. Our experience in this area has helped us determine the best learning methods for IT professionals. We feel our Blended Live delivery format is a best-in-class method that enables students and companies to close critical skills gaps and meet the needs of today’s modern learner. Learning Tree competes with Global Knowledge in multiple product areas and has a well-articulated blended learning offer that is available on several of their courses. Their blended learning offer is more augmented on-demand than a true blended learning solution. An instructor-led review session is included but it doesn’t pace students through the content. It’s entirely up to the student to complete the on-demand content and attend a review session. Offered for specific courses within their Azure and Data Sciences programs, New Horizons’ blended learning courses feature virtual instructor-led sessions and access to online resources like mentoring, labs and on-demand content. While technically this is a blended solution by definition, it does little to elevate the offer above a standard virtual instructor-led/on-demand package. StormWind pitches their video-based training approach as a blended learning solution. And it does include access to reduced length, instructor-led sessions combined with access to their course video library and other learning resources. But like other pseudo-blended approaches, StormWind is merely combining various learning resources and calling it blended learning. Primarily an on-demand provider, Simplilearn’s Flexi-Pass product combines access to instructor-led virtual classroom sessions with access to self-paced content. Essentially this product provides multiple versions of the course content (virtual instructor-led and on-demand) but consumption and participation is still dependent on the student. That’s it. There are a few non-IT training providers that have some blended offers but no other training provider is offering a blended solution for IT or business technical training. What are the on-demand players doing? Through my research it appears that Pluralsight, Lynda.com and CBT Nuggets are focused on their core business of on-demand courses and subscriptions. Which isn’t a bad thing. All of these providers offer products that are interesting to many IT learners. But IT professionals are realizing these all-you-can-eat options are limited in their effectiveness. And though they are work-friendly, any benefit derived from these products is based on the individual learner’s initiative to determine their learning needs, ability to locate the relevant content, and complete the training on their own. Taking cues from public and higher education, Global Knowledge sought to create a better way to learn with its blended learning solution—one that delivers better learning outcomes. Blended Live combines the expert direction of instructor-led training with the convenience and flexibility of on-demand learning. It is truly the best of both worlds and allows students to close critical skills gaps more effectively while maintaining their work and home responsibilities. Figure 2: The typical Blended Live course starts with an introductory instructor-led session followed by multiple weeks featuring an on-demand assignment and an instructor-led review session. 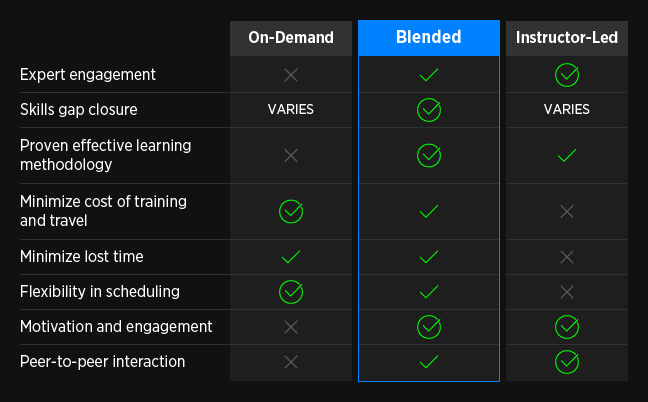 Blended Live reduces the impact of training by shifting the time-intensive, lecture-delivered content to an on-demand format. Dedicated instructor-led sessions are minimized to single 3 to 4 hour sessions every week. And finally, the training duration is spread over several weeks to spread the impact and allow employees to train effectively and maintain their work responsibilities. Instructor guidance is a key feature of Blended Live. By utilizing the instructor-led sessions to enhance rather than duplicate the on-demand content, Blended Live elevates retention and skills acquisition. Exercises, labs and content reviews are designed to improve the learning experience. And with a flipped classroom methodology, instructors are available for questions, direction and mentoring when they are most needed. The weekly instructor-led sessions not only enhance the learning experience, they enable the learning experience. By breaking the content into smaller, more digestible chunks, students are paced through the material. The smaller weekly assignments are less intimidating and students are more likely to complete the content to keep pace with their group. Students (and companies) can realize higher completion rates, greater content retention, and a decreased impact on work time. Blended Live utilizes a flipped classroom methodology. The general lecture content is delivered via an on-demand source and is completed at a time that works best for the student. Instructor time is focused on labs, exercises and reviews that support and enhance the lecture content covered in the on-demand materials. In this scenario, instructors lead students through their training material and are available for questions and guidance when they are needed most. Multi-day, instructor-led training is a proven and effective learning method. But there are several reasons why shorter length (2 to 5 days) training sessions are difficult for students. Multi-day training sessions are intense, information-packed, content-heavy downloads. Blended learning addresses these issues by chunking a typical weeklong course over five weeks. This reduces work time impact while also allowing students to learn at a more reasonable pace. By giving learners more time to absorb content, Blended Live enables a higher retention rate and better knowledge transfer. Blended Live employs a challenge-based learning methodology. The typical classroom lecture is delivered on-demand. Students can digest this content on their schedule and in chunks that meet their learning styles. More importantly, instructor-led sessions are focused on exercises and challenges designed to reinforce the content learned from the on-demand sessions. Students learn by doing and exit class ready and able to apply what they’ve learned. Blended Live is designed for student success. Incorporating the concepts of blended learning, challenge-based learning, and flipped classroom methodologies, Blended Live is designed to maximize flexibility and content retention, and minimize workplace disruption. We have designed Blended Live to better meet the needs of today’s professional learner so they can effectively build new skills while maintaining their day-to-day responsibilities. We launched Blended Live in September 2018 with three introductory courses and are continuing to build a robust course portfolio. As of February 2019, we have 15 Blended Live courses in Cisco, Microsoft, Networking and Cybersecurity. And we aren’t stopping there. By March, we plan to have 30 Blended Live courses including a new technology area, IT Best Practices, which includes ITIL® and Project Management. By September, we plan to offer over 50 Blended Live courses across even more technology areas. Global Knowledge is committed to providing our students with the best options to learn, whether it’s in a classroom, a virtual classroom, on-demand, in a private group setting, or a blended approach.